Payroll professionals that want to cover the full spectrum of payroll topics in a 2-day workshop format based on the latest NZPPA Payroll Practice Guide. The workshop is also aligned to the NZPPA Certification framework (levels 2-5) and will prepare participants to undertake the online assessment requirement of certification. To find out more on NZPPA Certification click here. This workshop is for payroll practitioners with intermediate to advance payroll experience. Participants may be asked to provide proof of experience. The Payroll Masterclass is delivered as a workshop and within each module participants will be involved in doing exercises and activities related to the topic along with an end of module assessment activity. 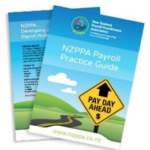 All attendees receive a physical copy of the NZPPA Payroll Practice Guide valued at $275 + GST. To find out more on the NZPPA Payroll Practice Guide click here. Each module of the Payroll Masterclass has an end of module assessment activity and participants have the option to do these as a self-assessment or to have workshop leader assess their work submitted. All participants will receive a NZPPA Certificate of Attendance. If a participant chooses to have their end of module activities assessed they will receive if successful a “NZPPA Payroll Masterclass Certificate of Competence”.